You've got make-up skillz to pay dem billz! LOL! I love it! This is very pretty! I love it! :) I also love the pop of glitter. Excellent! I can never get my eyeshadow that flawless! Yes very barbie! Pretty pinks! Love the touch of glitter. This is pretty. I <3 PINK! You have very pretty eyebrows too =). Love the glitter and I agree w/ every1 else on your perfect brows. 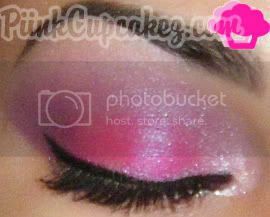 Loving this pink...hawt, def with the touch of glitter. Niiiice girl! Ooo.. Beautiful look. Love the colors! My fave!